Beidh neart spraoi, cluichí agus Gaeilge ar siúl ag an bPicnic le Chéile ar Satharn 20ú Meitheamh i bPáirc an Chaisleáin, An tAonach. Tabharfaidh an ócáid seo, a bheas eagraithe ag Ghlór na nGael agus Conradh na Gaeilge, An tAonach, deis do theaghlaigh Gaeilge agus dátheangach, chomh maith le teaghlaigh gur mian leo breis Gaeilge a úsáid sa bhaile, teacht le chéile chun nascanna a chothú agus a láidriú agus chun spraoi a bheith acu lena chéile. Iarrfar ar gach teaghlach picnic a thabhairt leo agus páirt a ghlacadh san ócáid Gaeilge seo. Má tá aon eolas breise ag teastáil, déan teangmháil le Cabríní de Barra, Oifigeach Forbartha do Chúige Mumhan le Ghlór na nGael ar 083-4455914/cabrini@glornangael.ie nó le Kim Ní Mhaolchatha, Oifigeach Forbartha Gaeilge le Conradh na Gaeilge an tAonach ar cnagantaonach@gmail.com. 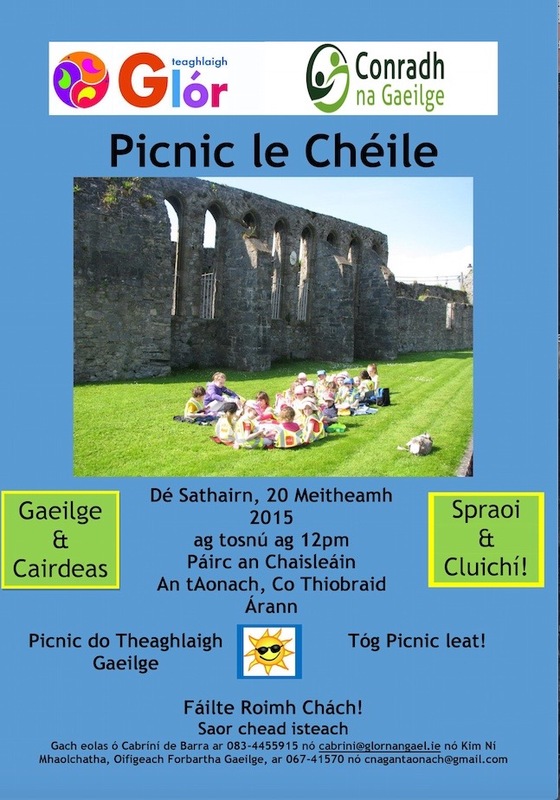 Lots of fun, games and Gaeilge will take place at the Picnic le Chéile on Saturday 20th June at 12pm in the Castle Park in Nenagh. This event, which is being organised jointly by Glór na nGael and Conradh na Gaeilge, An tAonach will provide an opportunity for Irish language and bilingual families, as well as families who wish to increase the use of Irish within their home, to come together so as to develop and strengthen links, and just have some fun! All families are invited to bring a picnic and to take part in this Irish language event. Further information is available from Cabríní de Barra, Glór na nGael’s Development Officer for Munster on 083-4455914 / cabrini@glornangael.ie or from Kim Ní Mhaolchatha, Irish Language Development Officer with Conradh na Gaeilge an tAonach on cnagantaonach@gmail.com.